On Viktor Jirsa’s laptop video screen, a patient sits on an unmade hospital bed, her back to the camera, her head wrapped in white bandages. Beneath the bandages 10 small holes have been drilled into the skull, through which 10 cm long rods have been carefully inserted into the folds of her temporal and prefrontal lobes. These devices will measure the activity in her brain during an epileptic seizure. As invasive as this sounds, still more invasive surgery awaits, to open the skull and remove part of the brain responsible for the epilepsy. But the success rate of this kind of surgery averages only about 50-60% and has not progressed in 30 years. Which is what Jirsa and his team are working to improve. They believe they are on track. They are doing complex, multi-faceted work that uses brain models developed within the Human Brain Project to create personalised medicine that gives surgeons the most accurate information available. An early, small, clinical trial has produced promising results and a larger trial is coming. “To me, this is a purpose of the Human Brain Project, to replace in-vivo by in-silico, to make it as non-invasive as possible so that at some point we may be able to completely stop this process of cutting people’s brains open,” Jirsa says. Epilepsy affects about 1% of the population. For nearly one in three sufferers, like the one on Jirsa’s computer screen, their epilepsy does not respond to drugs and the only treatment option is brain surgery. Jirsa is a deputy leader in the HBP’s theoretical neuroscience team. He is based at the University of Aix-Marseille in France, where he is Director of the Institute de Neurosciences des Systèmes. He studied both theoretical physics and philosophy and is following a lifelong desire to understand the brain. To improve epilepsy surgery, surgeons need high quality information about which area of the brain to cut, before they open the skull. This means locating the epileptogenic zone and finding the region of the discharging lesion that characterises epilepsy. To locate this region Jirsa’s team start with an MRI or CT scan of the patient. This provides a picture of the individual brain. Next are the electrode implants (through holes that are drilled by a surgeon, or increasingly by surgery robots that navigate using 3D MRI scans). The patient wears the electrodes, known as a Stereotactic EEG, for several days, as multiple seizures are recorded. Patients are also filmed so that their behaviour during seizures can be correlated with the readings from the brain implants. Jirsa says some experienced physicians have successfully determined the epileptogenic zone solely by observing behaviour during a seizure. In the case of the patient in Jirsa’s laptop video, as the seizure begins, she first becomes agitated, then rocks back and forth, taps her hands and legs, sways, and finally starts to sing a nonsense song. As Jirsa says, these are symptoms that would, in mediaeval times, have left her branded as a witch or as possessed by evil spirits. Today, these symptoms are carefully mapped to the readings from the electrode implants, one more part of a complex effort to relieve her of the effects of epilepsy. (It should be noted that the stigmatisation of people with epilepsy carried on well until the 20th century, as recently as 1914 it was illegal in 13 US states for someone with epilepsy to get married). The next step is where the work of the HBP enters the process. 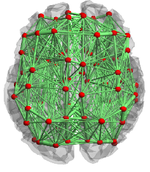 Jirsa’s team creates a personalised model of patient’s brain using the mathematics of mean field theory and the work of the HBP theoretical neuroscience collaboration. What is the mean field? Think about temperature, Jirsa says. Temperature is essentially a mean field created by the average kinetic energy of individual molecules. “Temperature is a collective variable that has no meaning at the individual molecule level,” he says. Knowing the temperature, is of course, extremely useful. Just as it is useful to reduce the complexity of the brain to fewer variables. Then, using the brain atlases developed by the HBP teams exploring and mapping the human and mouse brains, it is possible to build network models of the neuron populations with anywhere from 84 to 16,000 nodes. These population models trace out the folded surface of the brain in three dimensions and are made to mimic the patient’s own brain – a personalised model. The brain model is personalised further by incorporating any malfunctions or abnormalities identified by the surgeon. “The final piece of individualising is locating the zone of the epilepsy,” says Jirsa. This comes from the data captured by the electrode implants, with machine learning techniques employed to estimate the epileptogenic zone. From here they can test the hypothesis of which area or connection of the brain is the best to cut and run this in the model to confirm, reject or refine. A first small trial of 15 patients showed a significant improvement and a larger trial is on the cards. Jirsa says there is also the future promise of novel, less invasive, technologies such as laser surgery, which can be performed through the same holes drilled for the electrodes. A collaboration with Cleveland Clinic, in the United States, has given a proof of concept that it may be possible to use the laser to make a few small distributed lesions to stop the seizure from propagating (the harm from epilepsy is largely caused by the spread of seizures to healthy brain areas). Virtualisation of a personalised brain model. a) Non-invasive imaging (MRI, CT) provides personalised images of a human subject's brain. From these images, Jirsa's team reconstructs subcortical and cortical surfaces (top left and middle) and connectivity (top right). These elements are aligned and coregistered in the same coordinate system. A parcellation of the surfaces breaks the brain down into network nodes, which are then connected by the personalised connectome. b) Network nodes and connectivity are organised in 3D physical space, providing a three-dimensional avatar. Once each network node is equipped with a mathematical representation of a neuronal population model, the brain model is functional and computer simulations generate brain model activity and its associated neuroimaging signals (see The Virtual Brain http://www.thevirtualbrain.org). Virtual Epileptic Patient. a) The Epileptogenic Zone (EZ) is traced out in a patient's brain model, where heat map shows the spatial distribution of epileptogenicity (from low (cold colors) to high (hot colors) epileptogenicity). The heat map is either based on the clinician's hypothesis or derived from the application of machine learning methods to the model and empirical SEEG data. b) The patient's brain model generates spontaneous seizure activity mimicking the various seizure propagation patterns and its dynamic repertoire of symptomatic and asymptomatic seizures.